SPAIN CAPTAIN SERGIO Ramos likened Thursday’s news conference to a “funeral” as he cut short his pre-match media commitments having fielded numerous questions about the sacking of Julen Lopetegui. Lopetegui’s shock departure dominated headlines on the eve of Spain’s World Cup Group B opener against neighbours Portugal in Sochi, where Ramos and new head coach Fernando Hierro fronted a huge media contingent inside Fisht Stadium. Ramos was asked about the decision to sack Real Madrid-bound Lopetegui just two days before Spain open their World Cup campaign and the skipper was in no mood to dwell on the 51-year-old’s exit, eventually walking away with a smile on his face. The first question centred on Lopetegui, and Ramos – who will come up against Madrid team-mate and Portugal captain Ronaldo - told reporters: “Well, we needed to move forward as quick as possible. It wasn’t pleasant times. Julen was part of this effort. He helped us qualify. Ramos continued: “These are situations as a captain [where] you’re slightly more aware about what’s going on. We can all have interpretations. Others make decisions. We prefer to stick to the sidelines. 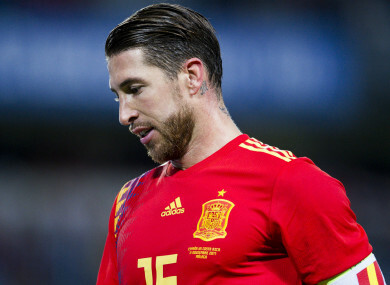 Ramos was then asked if Spain’s players had attempted to convince the Royal Spanish Football Federation (RFEF) to keep Lopetegui in charge for the showpiece tournament in Russia, but the Madrid captain refused to give anything away. “It’s not for the players to speak on these issues,” he said. “We don’t make these decisions. Others do. Players focus on sporting things. We are most comfortable on the pitch. I don’t know if anyone made a mistake. It’s not up to me to discuss that. Over time we will hear different opinions. I’d rather not dwell on this moving forward. Nothing has changed. We keep the same hunger. We play every match as a final. As if it were our last. It’s a way of staying motivated. We need to live up to our standards. We shouldn’t use any of this as an excuse. Leave anything secondary on the sidelines. The attention then turned to Ramos and the backlash following last month’s Champions League final in Kiev, where he tangled with Liverpool star Mohamed Salah – who suffered a shoulder injury that placed his World Cup in doubt. And that is when Ramos had enough, replying: “I sleep very well at night. I have an easy conscience. Some people try to use certain arguments to become more popular. I don’t worry about those things. I am the way I am. I’ve shown this for the last years. Anyone with doubts can check my CV. Email “'I would just like to leave this press conference because it seems like a funeral'”. Feedback on “'I would just like to leave this press conference because it seems like a funeral'”.